When I was a kid, I remember reading a short story, possibly from a book of short stories, that finished with the Old Man Of The Sea swimming away in a furious huff. He was seething because his plans had been somehow thwarted. 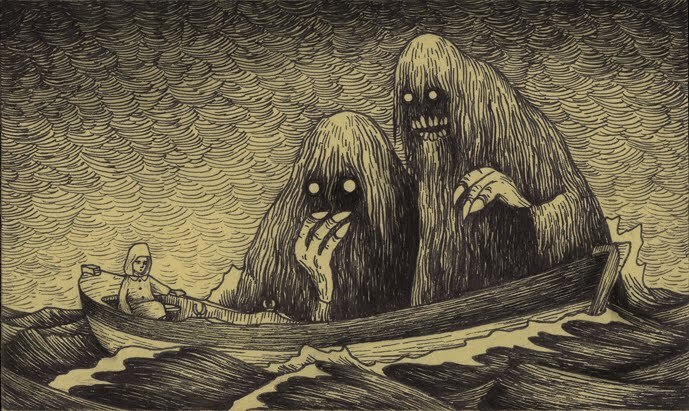 I remember the illustration in particular — the old man, long hair swamped by the sea, low down and mean in the waves. I’m now trying to find this book, but haven’t a clue what it’s called or who wrote it. I’m fairly sure it’s not the Grimms or Andersen, and we’ve also now discounted The Water Babies, Rupert the Bear, Sinbad, and The Old Man Of Lochnagar. Dora loaned me her good pencils so I could draw an approximation of the old man in his grump. Here he is — any ideas? Dora and I were listening to BBC 6Music on the radio yesterday morning. The news came on and said something about David Cameron. ‘He takes photos,’ said Dora, with confidence. I bit back my first response, because I’m trying really hard not to indoctrinate my daughter. ‘He used to run the country,’ I said. Still frowning, she jumped down from the table and ran into the living room. After a minute of clattering, she ran back to the kitchen, and with great care, placed a €0.05c coin in the palm of my hand. She had raided her piggy bank of ragtag pfennigs, drachma, centimes. These are her treasures. She nodded—yup, job done—and went upstairs. If your plan is for one hundred years, educate your children. In the nine years since I started writing fiction, I have completed three novels and a novella. All of them have been written in the first person, and needed me to immerse myself entirely in another character, another world; and so I’ve been a veteran of WW2, flitting between London and Burma; a 17-year-old girl, desperate to escape her Scottish island; an arthritic fisherman walking across Morecambe Bay; and a fortune-teller seeking herself in a world of swamps. My stories are becoming steadily more fantastical. They’re taking me further from myself. That’s fine in terms of what I want to write about, but it also makes it harder to come back. My friend Ali Shaw once compared writing to being underwater, and I think that’s right; the deeper you go, the further you get from the surface. After finishing each of these four stories, I’ve experienced a few weeks of manic creativity, cartwheeling through handfuls of shorter pieces. Most recently, on wrapping up a first draft of The Hollows, I redrafted and typeset Dare in a week. But then, after these bursts, I’ve always fallen into something of a slump, and that’s where I am now, casting about for what to do, suddenly convinced that all those months of work are worthless. I’ve talked before about how I write to drown. Over time, that immersion—especially in something as big as a novel—becomes total, until it’s the real world that becomes disorientating. I’m so fortunate to have in Mon someone who understands that stories leave me stoned; she helps me find my way. But returning to the real world feels odd. I’m struggling to get excited about things I should be excited about. I’m distracted and quick to gloom. I suspect that almost all creative work is built on a measure of doubt, and right now that’s all I have, needling and nagging all the time: what if it’s garbage? All of it? Everything I’ve done? The last year was wasted work. What if this year is too? How would I start again? I would start again, because I have to. But the further I get from The Hollows—and it’s vital, I know, to get some perspective, to put distance between me and it before I go back to redraft—the more that doubt creeps in. Almost everyone I know, and certainly all the writers and artists, struggle with doubt. Carving out and sharing these inside parts of your head is an excruciation. I couldn’t write without that doubt; it keeps me lean, questioning, pushing myself to do better, to be better. Doubt is the compass of when I’m not good enough; and so to cut, rewrite, cut, rewrite, cut. But here’s the crux: when I’m not writing, not working on a story, that doubt—the same doubt I need to write in the first place—has nothing to gnaw on but me. It bites harder than ever after spending so long in another world, and then leaving it behind. That’s the Slump. So quit wallowing and start something new, right? It’s not so simple. I have several ideas lined up for what I’ll do next, and I’m 2,000 words into my first proper short story in over a year. But from a pragmatic point of view, it’s senseless to start another big project before I’ve polished off the last, and every redraft is distinct and demanding. The Slump goes beyond that anyway. It’s a spiritual anticlimax. It’s hitting a wall after running a marathon. It’s a burn out, an exhaustion of ideas. I don’t really know how to get myself out of the Slump, other than to take heart from the knowledge that I always have before. This morning I played hide and seek with Dora. That helped. This afternoon I’m going back to my short story. That may help too. Half-a-dozen people have now read The Hollows. They’ve all enjoyed it, I think, and they have all suggested a few things that don’t quite work; thankfully, these things have pretty much been the same for all of them, and they also tie into my own sense of the story, now I’m getting some distance from it. Redrafting would be impossible without that sense of triangulation, which is, in turn, why writing needs community. I’m gearing myself up for potential edits, but I’m not there yet. I think I’ll be ready by the time this slump comes to an end; or perhaps the slump comes to an end because I’m ready. It’s coming closer, but it’s not here yet. Writing is doubt. Writing is perspective. Passion. Immersion. Empathy—books are empathy machines. Writing is the witch in your kitchen in the corner of your eye. If you spin to look at her directly, she’s gone. Writing is a sideways mirror. Writing is accidents of words, like wind chimes are accidents of music. I don’t know what else to do but play on through it. Last night, more or less six months since I started, I gave the first draft of The Hollows to Mon to read, and I sent it to my amazing agent Sue. Mon and I took Dora out to tea, then she started reading. Sixty pages in and she hasn’t ditched it in a flurry of disgust, so there’s hope for me yet. I thought it would easier to let go of the second book, but I was wrong. I thought I’d feel more confident, more certain. I don’t. If anything, the stakes feel higher. What if I’ve moved backwards? What if no one likes the story, the characters, the writing? I’m happier with this story than anything I’ve done before, but what if I’m wrong? What if I’ve got worse? I didn’t entirely understand the proverb about not seeing the wood for the trees until I started writing novels. When I’m so immersed in my work, in my worlds, it’s easy to lose perspective on whether it’s actually any good. My own, personal instinct for story is stronger than ever, and getting stronger still; but there’s nothing on Earth to say it’s actually right. There’s no way to triangulate what happens in my heart with the world around me. In that sense, every novel – and I’ve written three of them now – is a first novel, feeling in the dark for cellar steps. Maybe it gets better in time. Maybe it gets easier. But I can’t imagine what that feels like, how that would be. It’s strange to be so terrified of the only thing I want to do. As Mon was reading, I glanced across at her every thirty seconds, every minute: which page is she on? What happens there? Oh lord, is that all right? Does that dialogue work? Do I believe it? Will she believe it? Dora woke at 4.30am this morning, claiming it was too dark to sleep. I put her back to bed, where she fell asleep in moments, but then I couldn’t because, ahahaha, it was too light. So I’ve been up for hours, listening to songs I love, making a Mogwai mixtape for a friend, catching up on email, gazing out the window and thinking, thinking. There’s no light quite like the glow of dawn. The world is luminous, and then it turns to gold, and it sleeps on into the rising sun. No one knows but foxes, cats and milkmen. I imagined what it must look like on the river Kent between Burneside and Staveley right now, right now, with no one there at all, only the swallows and the martins flitting on the river, vapours coiling on the water, sun sliding sideways through the trees, a hidden valley with half the world in shadow and half the world on fire. I know what my next four or five novels look like, and I have fourteen flash stories to write. Today, though, I’m taking my daughter swimming. She’ll be Peso the penguin and I’ll be Kwazi the cat, and we’ll look for treasure and help sick sea creatures along the way. Dora loves swimming, but she’s scared of having water on her head – she won’t jump in, and hates being splashed. But today, for the first time, we’re going to see how things go with goggles. Maybe – with some support, some courage, and some curiosity, today will be the day she looks underwater, the day she discovers there are other worlds, other places, other ways to see. Letting go is hard. Feeling for that cellar step is hard. Maybe all of us need to be brave.